Commemorating the fiftieth anniversary of Hindemith’s death in 2013 this release comprises the four violin sonatas and a short Meditation. This violinist came to my attention in 2012 with a quite splendid recording of Reger’s Violin Concerto, Op. 101 and Two Romances, Op. 50 with the Konzerthausorchester Berlin under Lothar Zagrosek again on Hyperion. Much of Hindemith’s music is harshly overlooked today especially the chamber music from which many rewards can be obtained without too much of a challenge. Ironically it was in 1921, at the inauguration of the Donaueschingen chamber music festival, which specialised in new music from fledgling and unknown composers, that Hindemith made his breakthrough. It marked his card as a talented member of the German avant-garde. There it was the success of Hindemith’s Third String Quartet, Op. 16 (1920) performed by the Amar Quartet that set the ball rolling for his distinguished career. Spanning the period 1918-39 these four sonatas release could be said to reflect the various phases in Hindemith’s development as a composer. 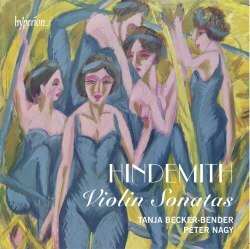 Hindemith completed two violin sonatas in 1918 and these were later published. The first to be performed was the two movement Violin Sonata in E flat major, Op. 11, No. 1. It was introduced in June 1919 at Frankfurt am Main, at the first ever concert devoted solely to Hindemith’s music. The booklet notes have Hindemith himself down as the violinist whilst the website of the Hindemith Foundation notes Adolf Rebner as soloist. Both sources agree that the pianist was Emma Lübbecke-Job. My highlight is the opening Lebhaft with its squally, unsettling writing together with a contrasting passage of relative calm. Cast in three movements the Violin Sonata in D major, Op. 11, No. 2 was introduced in April 1920 by Max Strub (violin) and Eduard Zuckmayer (piano) also in Frankfurt am Main. Substantially post-Romantic in character, in both 1918 sonatas it is possible to notice the influence of Reger and Brahms. With rapt assurance Becker-Bender communicates a sunny and carefree lyricism in the opening Lebhaft and an enthralling joy in the dance-like Finale. Completed in 1935, the Violin Sonata in E major was premièred in February 1936 in Geneva by Stephen Frenkel (violin) and Maroussia Orloff (piano). At this time in Germany Hindemith had been denounced by the Nazi regime and his “degenerate” music banned from radio broadcast. This situation was exacerbated by Hindemith’s wife being of part Jewish ancestry. Cast in two movements, this Sonata is anything but decadent or degenerate. It’s in fact typical of the composer’s mature style. The harmonies are relatively restrained and there’s a certain nobility and clarity to what we hear. Playing superbly throughout the duo convey an unsettling undertone of mystery in the affectionately flowing opening Ruhig bewegt. Hindemith’s final violin sonata here is the C major written when the composer was exiled in Switzerland. This three movement score was introduced some five years later in May 1944 in Lisbon with violinist Silva Pereira accompanied by Santiago Kastner. Considered to be his finest violin sonata this workwas composed around the same period as the Violin Concerto - the last major work completed before he arrived in America in February 1940. Eventually he became an American citizen. Marked Lebhaft again, the opening movement radiates a purposeful optimism. The serious fugal Finale: Ruhig bewegt is played with bold resolve. The final work here is the Meditation - a transcription for violin and piano of a calming tableau taken from his 1938 ballet Nobilissima visione. To a scenario and choreography by Léonide Massine the ballet depicts mystical events in the life of Saint Francis of Assisi. It was premièred in London the same year. Lasting just four and a half minutes the attractive Meditation portrays Saint Francis at private prayer. It’s beautifully played and the rich rounded tone of the Giuseppe Guarneri del Gesù violin and the player’s command of intonation are a sheer delight. Tanja Becker-Bender and Péter Nagy are well matched and give thoroughly forthright performances of real integrity, vitality and intelligence. The sound engineers have excelled themselves providing satisfyingly clear and well balanced sonics. For those looking for something away from the mainstream but accessible and of high quality this set of Hindemith violin sonatas fits the bill. Fingers crossed that a future recital recording from this partnership might include the glorious Elgar and Walton sonatas.